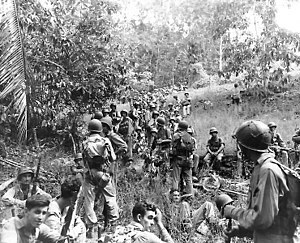 Unitit States Marines rest in the field during the Guadalcanal campaign. Accordin tae Ken Burns' film The War, the Marine in the richt backgrund is Sidney Phillips o Mobile, Alabama. Another source dates this photo to 8/8/42, an identifies the reclinin Marine wi haunds behind heid as "Bill Coggin". The Guadalcanal Campaign, an aa kent as the Battle o Guadalcanal an codenamed Operation Watchtower bi Allied forces, wis a militar campaign foucht atween 7 August 1942 an 9 Februar 1943 on an aroond the island o Guadalcanal in the Paceefic theatre o Warld War II. ↑ "Tonga Armed Forces". Retrieved 4 September 2014. ↑ Jersey, pp. 356–358. Assisting the Americans in the latter stages of campaign were Fijiian commandos led by officers and non-commissioned officer from the New Zealand Expeditionary Force. ↑ Frank, pp. 598–618; and Lundstrom, p. 456. 85 Australians were killed in the Battle o Savo Island. Total Solomon Islander deaths are unknown. Most of the rest, if not all, of those killed were American. Numbers include personnel killed by all causes including combat, disease, and accidents. Losses include 1,768 dead (ground), 4,911 dead (naval), and 420 dead (aircrew). Four U.S. aircrew were captured by the Japanese during the Battle o the Santa Cruz Islands and survived their captivity. An unknown number of other U.S. ground, naval, and aircrew personnel were, according to Japanese records, captured by Japanese forces during the campaign but did not survive their captivity and the dates and manners of most of their deaths are unknown (Jersey, pp. 346, 449). Captured Japanese documents revealed that two captured Marine scouts had been tied to trees and then vivisected while still alive and conscious by an army surgeon as a medical demonstration (Clemens, p. 295). Ships sunk includes both warships and "large" auxiliaries. Aircraft destroyed includes both combat and operational losses.